CHESTNUT HILL, Mass. - Kelly Pickreign made 18 saves for her first career win and Megan Keller picked up four points and wrote another Hockey East record as the No. 7/7 Boston College women's hockey team topped the University of New Hampshire, 7-1, on Friday night at Kelley Rink. The Eagles held a 2-0 lead after the first 20 minutes thanks to Delaney Belinskas and Keller, and then still had a two-goal edge after the first 40 minutes. Keller - who set the Hockey East single-season goals recorded at 14 with her first period tally - responded to a UNH goal with her second of the game to give BC a 3-1 lead at the second intermission. BC then erupted for three goals in the first 6:03 of the final frame to stretch the score out to 6-1. Cayla Barnes capped the scoring with a goal in the final minute. In her second career start, Pickreign was strong in between the pipes for the Eagles en route to her first career win behind 18 stops. Kyra Smith made 27 saves for UNH in taking the loss. BC held the 34-19 edge in shots on goal and was 2-for-3 on the power play while UNH was 0-for-5. February 8, 2019 | 6 p.m.
1st, 7:41 | 1-0, BC GOAL: Erin Connolly's shot from the right dot rebounded into the slot and Belinskas beat the enclosing defenders and muscled the puck inside the right post. 1st, 19:03 | 2-0, BC GOAL: Belinskas circled behind the net and came around the right side, sipping the puck to Keller. The senior cut her skates backwards to open up for a wrist shot that she sent over the left pad of Smith. 2nd, 1:57 | 2-1, UNH GOAL: A rebound of a shot by Nicole Dunbar from the left wing fell to Abby Chapman to slide home on the glove side of Pickreign. 2nd, 6:32 | 3-1, BC GOAL: On the power play, Barnes worked down the left side of the slot and popped below a defender towards the dot to zip a pass across the top of the slot to Keller. Keller's one-timer from the edge of the circle snuck in under the crossbar. 3rd, 2:46 | 4-1, BC GOAL: Makenna Newkirk won the faceoff and Daryl Watts picked it up, went around the circle and toe dragged a defender to cut back in towards the net before tucking it around Smith to the far post. 3rd, 3:35 | 5-1, BC GOAL: Caitrin Lonergan centered a pass from the right circle and Kelly Browne redirected the puck between the stick and shoulder of Smith. 3rd, 6:03 | 6-1, BC GOAL: After Watts nailed a shot off the crossbar, Lindsay Agnew pounced on the rebound at the right post. 3rd, 19:33 | 7-1, BC GOAL: BC entered the zone on a power play and Browne centered a pass to Barnes on the right side of the slot. Barnes was able to redirect the puck past smith. - With her first goal of the game, Megan Keller set a new Hockey East single-season goals record by a defender at 14 ... Keller now owns the single-season points, goals and assists records for a defender as well as the career points, goals and assists records. - The goal was also the 150th career point for Keller, making her just the sixth player in program history to reach that plateau. - Keller's four points marked her 11th multi-point game of the season ... it was BC's second four-point game of the season (Delaney Belinskas vs. Northeastern). - Keller's first goal of the game stood to be the game-winning goal, her fifth of the season ... that ties for fourth overall in the country and tops among blue liners. - Kelly Pickreign earned her first career win ... all three of BC's goaltenders now have at least one win this season, making it the only Hockey East school with three different goaltenders earning wins in 2018-19. - Cayla Barnes' goal was her first since Nov. 24 at Holy Cross ... the rookie has registered two points in two of the last three games. - Caitrin Lonergan has now registered at least one point in eight straight games ... Daryl Watts has registered at least one point in four consecutive games. - Makenna Newkirk won a game-high 15 faceoffs ... she also recorded her seventh multi-point game of the season with two assists. - Seven BC players total finished with multiple points. - The Eagles have out-shot the opponent in 18 consecutive games. - BC's seven goals were the most that UNH has given up in a game this season ... this was the second time this year that BC has scored seven goals in a game and seventh game of scoring five-or-more goals. 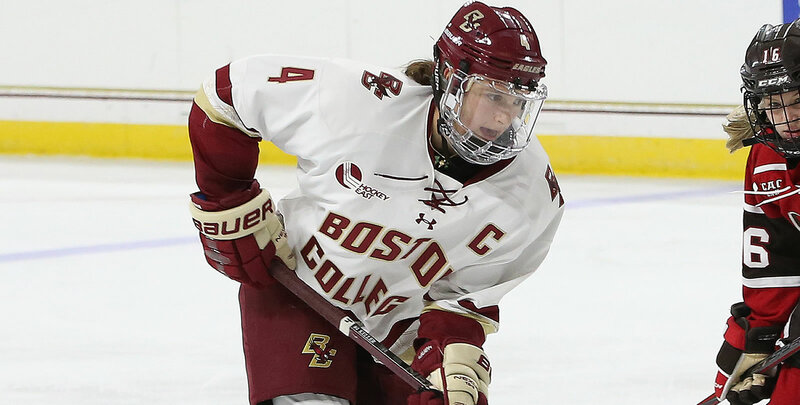 - The Eagles now have a record of 23-41-5 in the series, including a 13-20-2 mark at Kelley Rink ... BC is 22-25-4 against UNH since Hockey East launched its women's league in 2002-03. - Head coach Katie Crowley is 21-12-3 in her career against UNH. Boston College will face No. 3 Northeastern on Tuesday, Feb. 12 in the Beanpot Tournament consolation game.